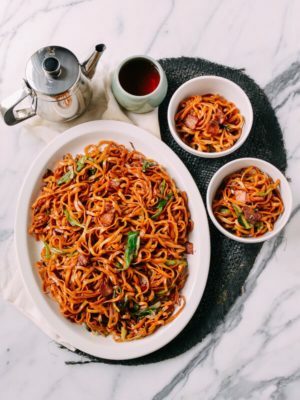 If you have read our post, “What is the best wok to buy?” you now know that our personal preference here at The Woks of Life is a classic carbon steel wok, and you may have even gone out and purchased one. 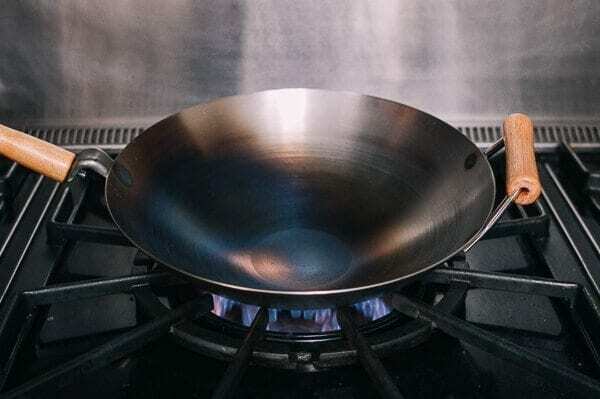 While we think carbon steel is the best all-around wok, it’s important to know how to season a wok. 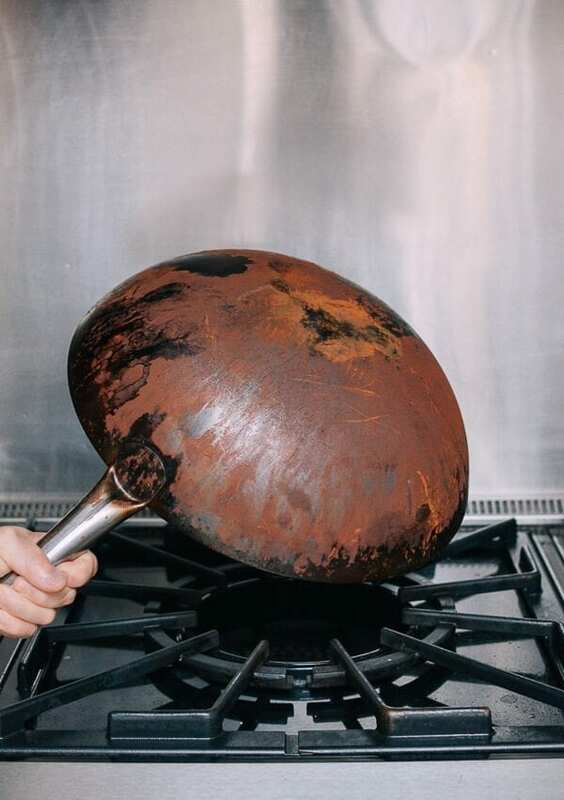 Most carbon steel woks do require a seasoning process before the first use and continued care and maintenance to build that perfect nonstick patina. 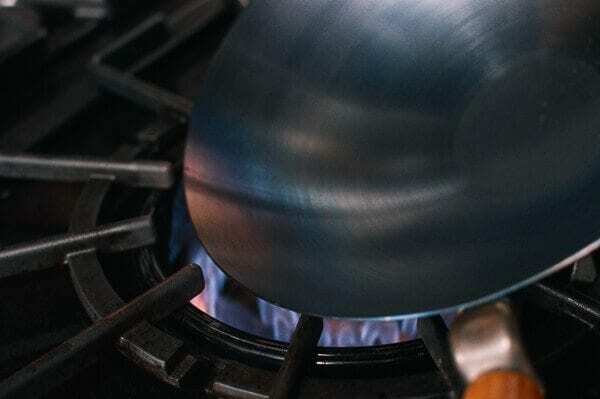 Basic carbon steel wok models typically range from 12 to 14 to 16 inches in diameter and are made with 14 gauge steel, which is about 1.6mm thick. 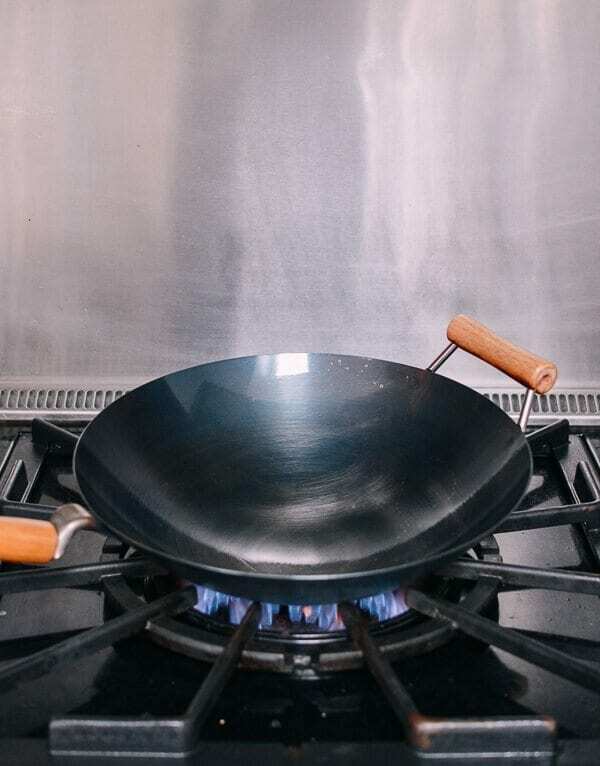 Most basic carbon steel woks made for home use have a long wood handle on one end and a wooden helper handle on the other so you can use two hands to lift the wok. Many Chinese grocery stores stock these basic woks, so try shopping locally and check your options online before making your final purchase. 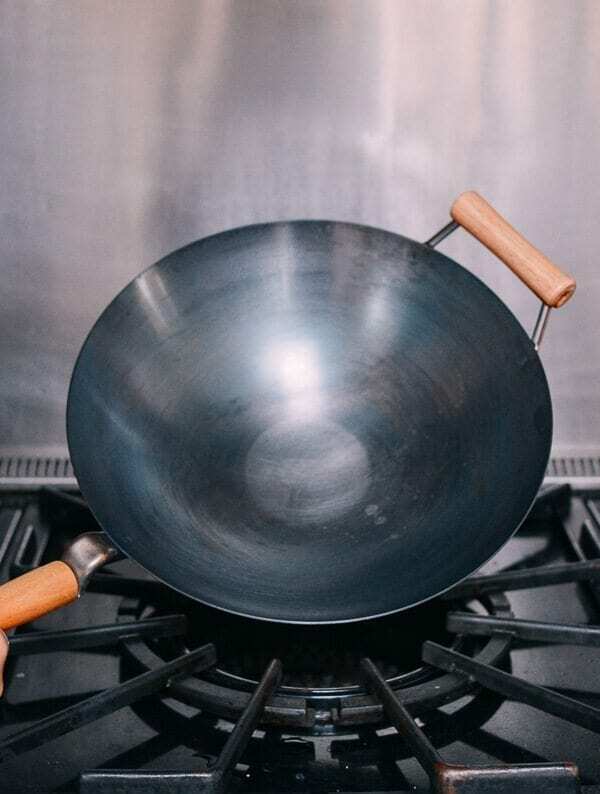 We have a few links and resources on our Chinese cooking tools page and on our recent post on how to choose the best wok for you. 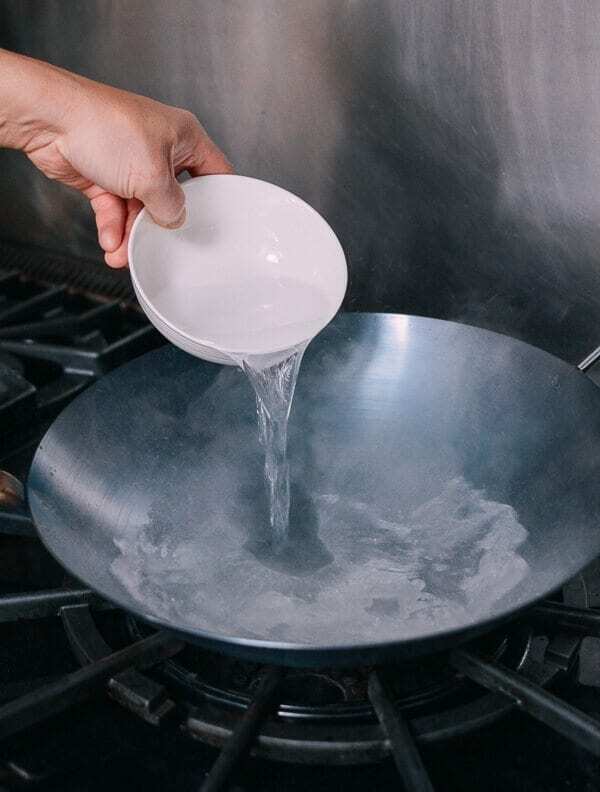 After you go through the initial wok seasoning process, all you need to do is cook with your wok often and follow our easy directions to care for it properly! 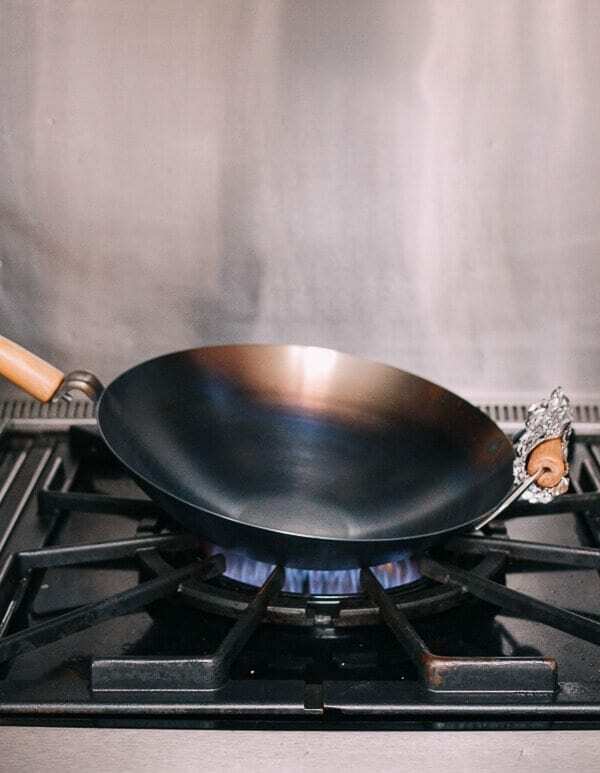 Cooking with your carbon steel wok regularly means that the steel will be exposed to lots of oil at high temperatures and over time, it will season naturally. 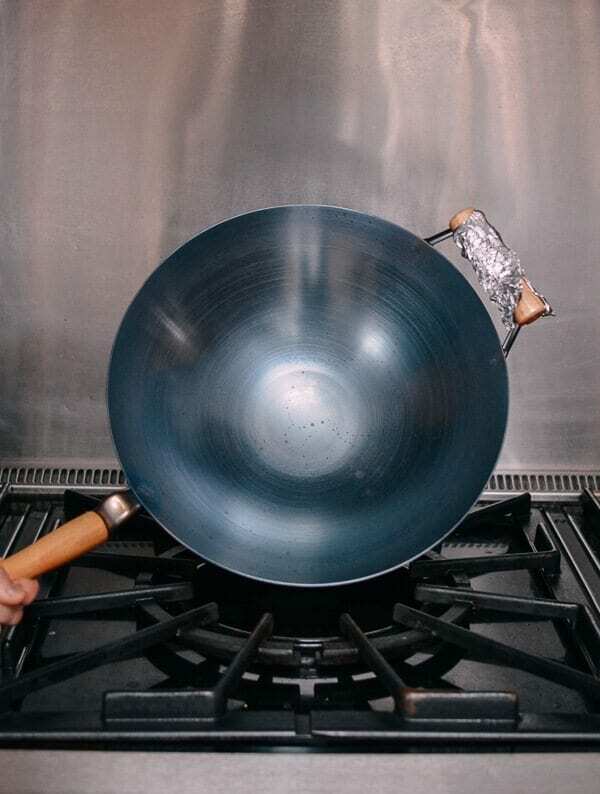 I made dinner at a friend’s house once, and I was horrified at his wok. It was covered in crusty layers and was downright greasy. His “method” of seasoning was not scrubbing the wok clean after use. Just follow those steps and essential pointers, and your carbon steel wok will age gracefully and form a beautiful seasoned patina that any Chinese cook would be proud of. 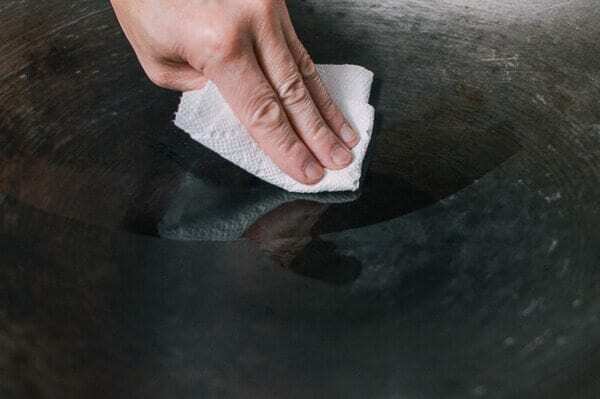 Your carbon steel wok will ultimately come with some oils and dust on it from the factory, so it is always best to give it a quick wash with some mild soapy water. 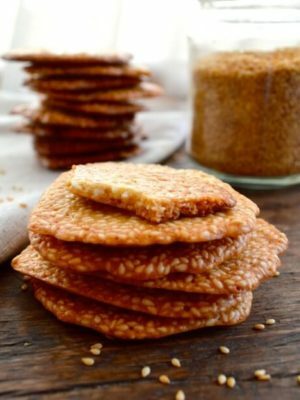 A scrub sponge with a green scouring pad on one side and sponge on the other is all you need; sometimes, for tougher crusted-on food we use a heavy-duty wire scouring pad. Set your wok on the burner set to the highest heat. Make sure you clear the stove area, because things will get quite hot. Keep a dry towel or a heatproof kitchen mitt handy. Once the wok heats up, it will start to turn a dark brown color and begin to smoke. This indicates that the residual oils from the wok are burning off. You cannot see much smoke in the photos, because we have our trusty kitchen hood going at full blast. Next, the wok will begin superheating and the impurities from those industrial oils will burn off. 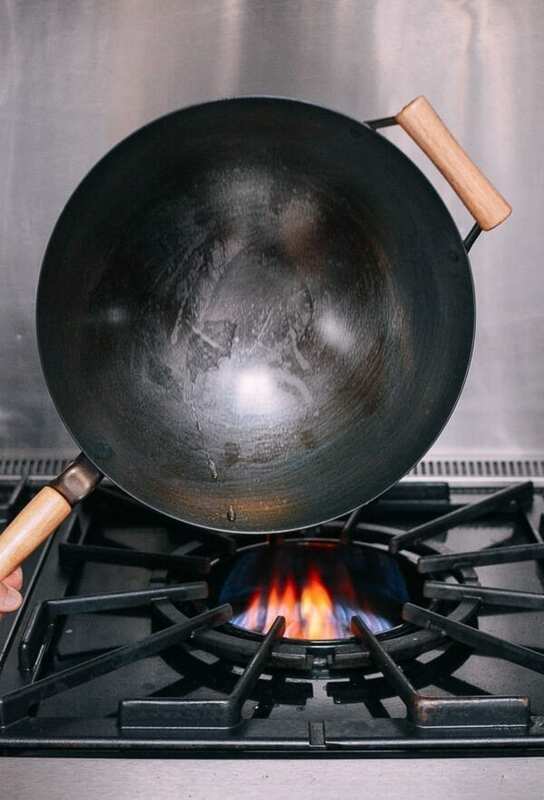 Tilt the wok to superheat one area at a time and the wok will turn black and blue as the carbon steel heats through. Continue tilting the wok while you systematically burn off the impurities, making sure to heat all areas of the wok. 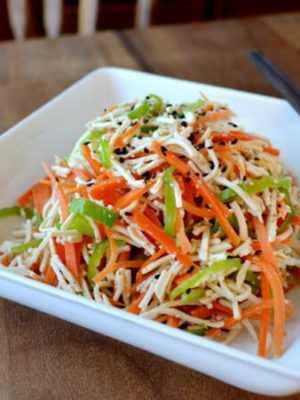 It may not turn brown in all areas, but be diligent at this step to ensure even seasoning. This heating process will take some time depending on how hot your gas stove is. 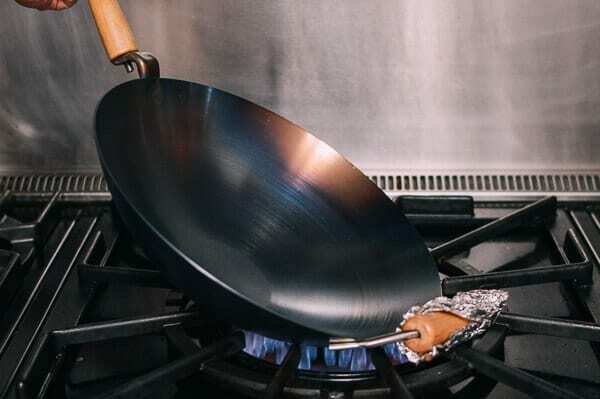 Continue heating and tilting until the wok is done. 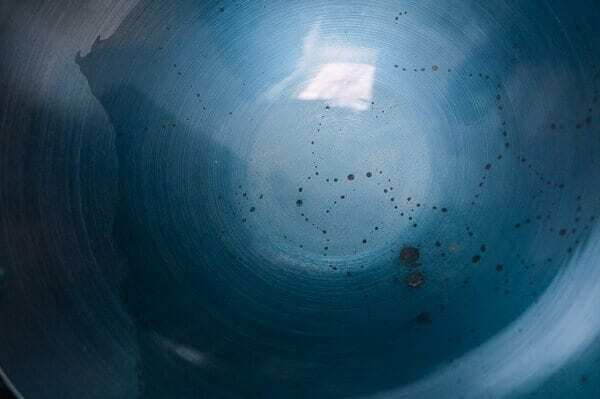 Once your wok has been heated, the carbon steel will take on a blue tint. Turn off the burner and set the wok back on the stove. 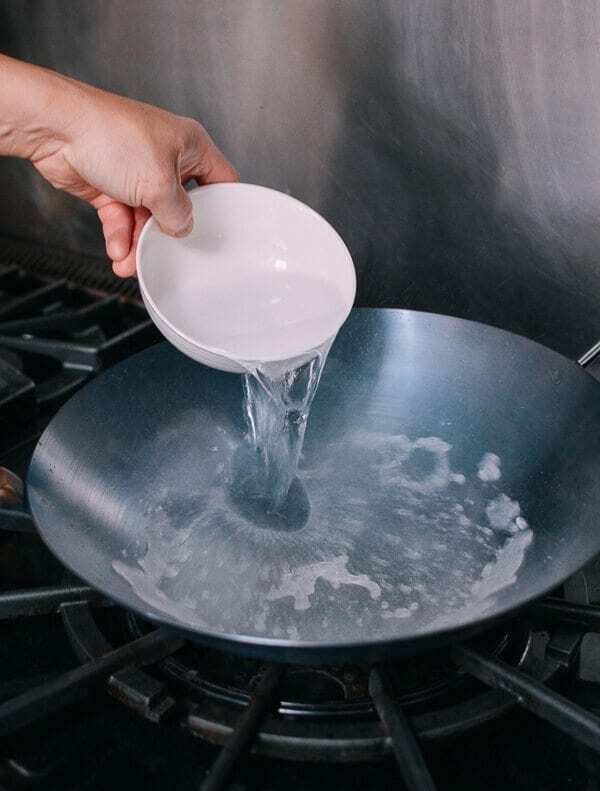 Pour one cup of water into the wok slowly to cool it off quickly. Be careful of the hot water splashing. 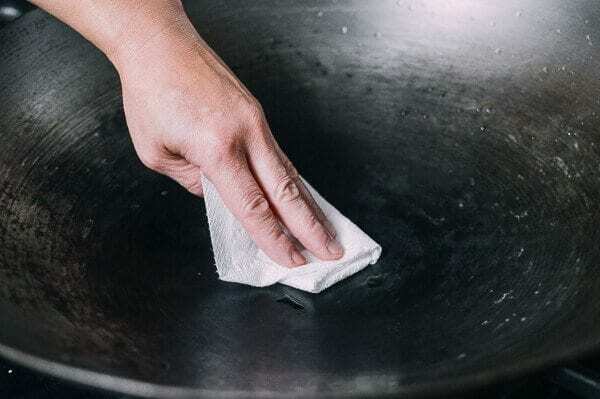 When your wok is completely cooled, move it to your sink, and use some mild detergent and your scrubbing pad to give it a light scrub. Rinse your wok thoroughly with clean, cool water. You may see some dark spots in the metal from impurities in the carbon steel, but it’s nothing to worry about. Wipe down the excess water with a paper towel, and place the wok back on the burner to dry it with medium high heat. 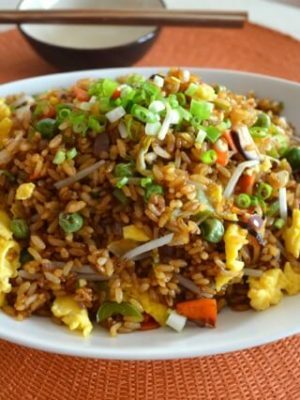 After the wok is thoroughly dried, add about a tablespoon of vegetable oil with the wok at low heat. Spread the oil around the wok by tilting it until you get an even coating around the wok and heat for about a minute. 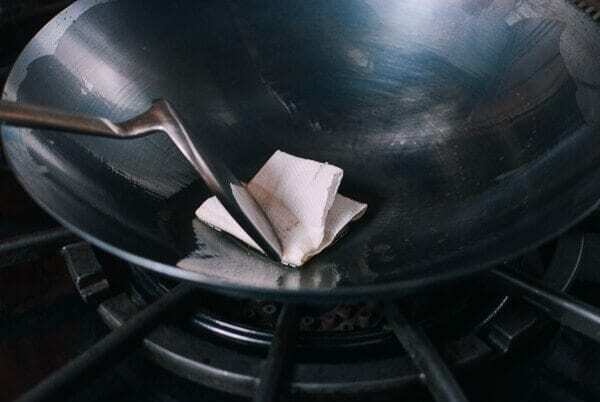 Turn off the heat and fold a paper towel twice and begin wiping down the wok. Use your wok spatula to start, since the wok will be hot. After it cools, you can hold the paper towel with your hands to continue wiping it down. I like to reheat the wok again before cooking on it until just smoking. Then turn off the heat and give your wok another light scrub with water only. 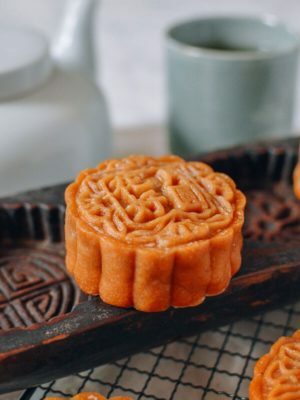 You can see that the vegetable oil will begin to form a patina already! 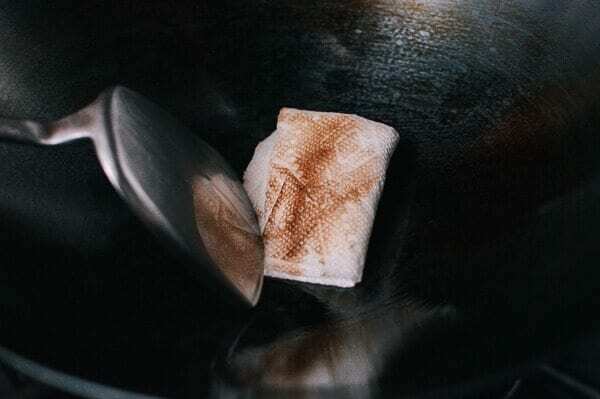 Towel off any remaining water, reheat the wok, and oil it again using a folded paper towel. 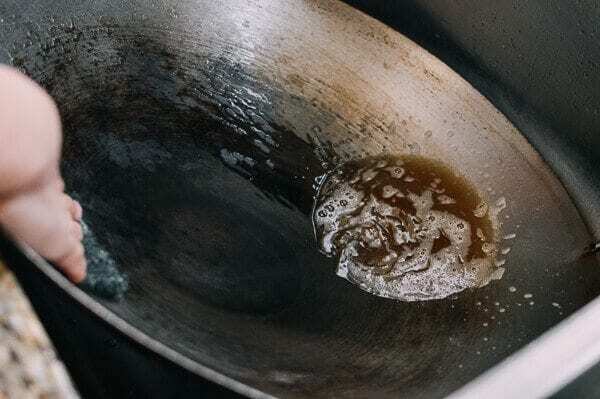 It’s normal for some cooking oil residue to remain on the wok, which over time forms that nice nonstick patina, a characteristic of a nicely seasoned wok, but wipe down the wok again to remove any surface residue. 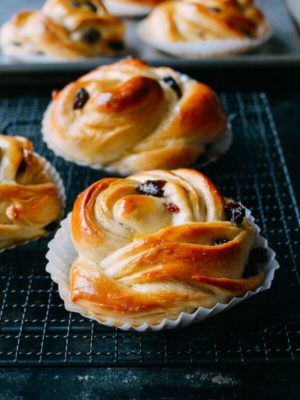 You will be repeating this process every time after you cook. For now, your new wok is seasoned and ready for your first stir-fry dish! 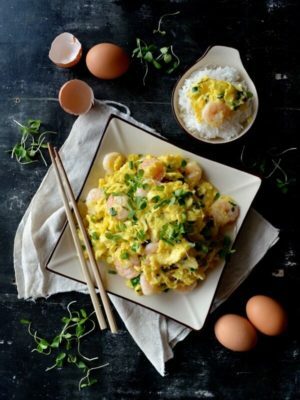 Cook your first dish after Seasoning your wok! 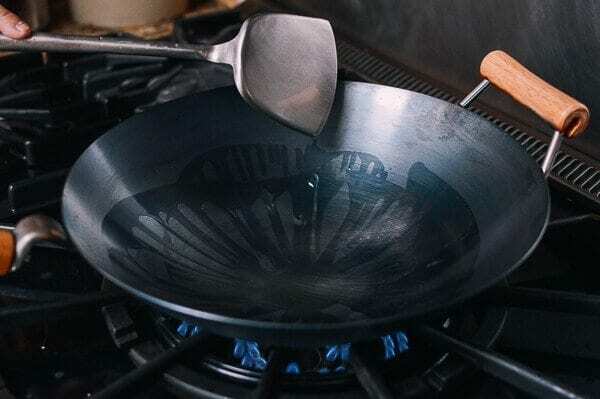 You can start start cooking right away with your seasoned carbon steel wok! 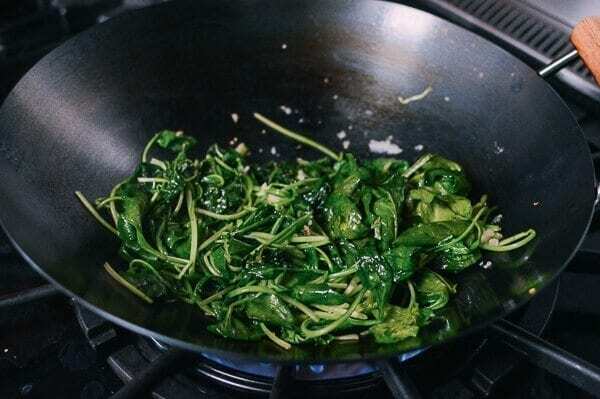 We chose to start with a leafy green dish like stir fried spinach. Heat the wok until just smoking, and add oil, minced garlic, and your spinach greens. 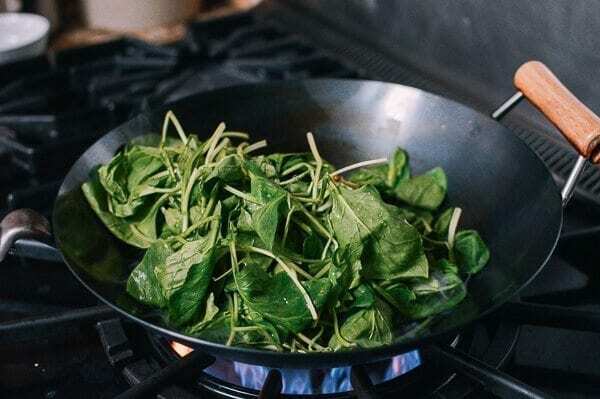 Stir-fry the spinach until they are wilted, season with white pepper and salt, and serve! 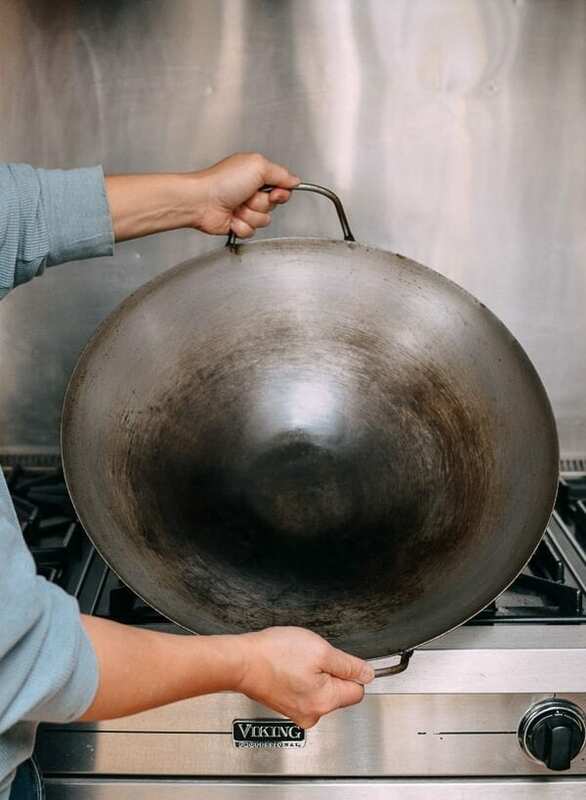 Now that you know how to season a wok, follow these easy steps on how to care for your seasoned wok over time. Towel the wok dry, reheat, and after it is cool enough to touch, wipe the entire wok down with a paper towel and a few drops of vegetable oil. 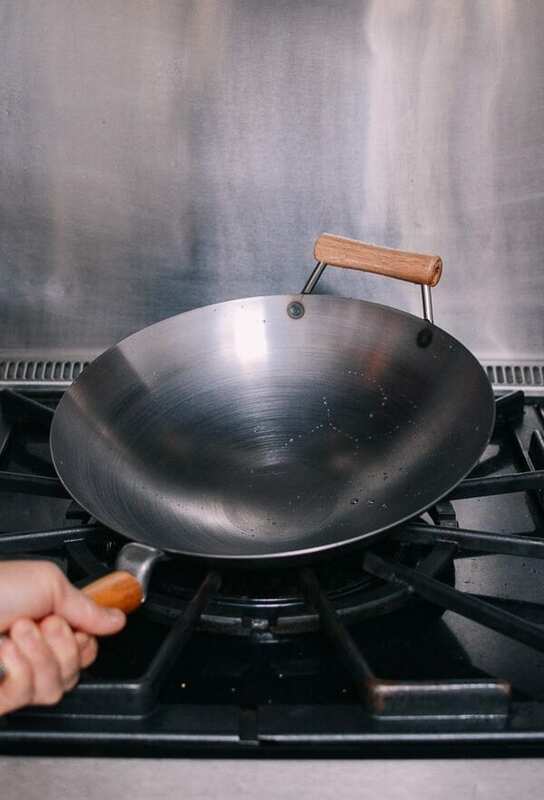 Your wok’s ready for storage until your next dish! Did you buy a carbon steel wok years ago and promptly forget about it? 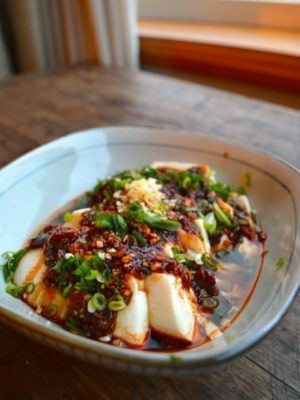 We’re here to get you to dust it off and get back into the swing of Chinese home cooking. But after a long time of no use, it may be a little worse for wear. That said, woks are more versatile than they seem. 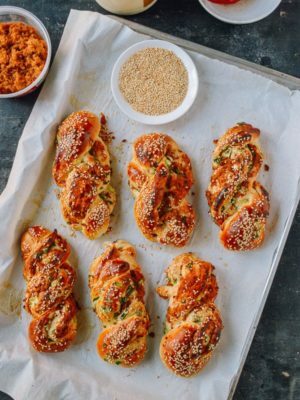 We always have ours on the stove to cook eggs, steam buns, make scallion pancakes, or even toast a piece of bread. 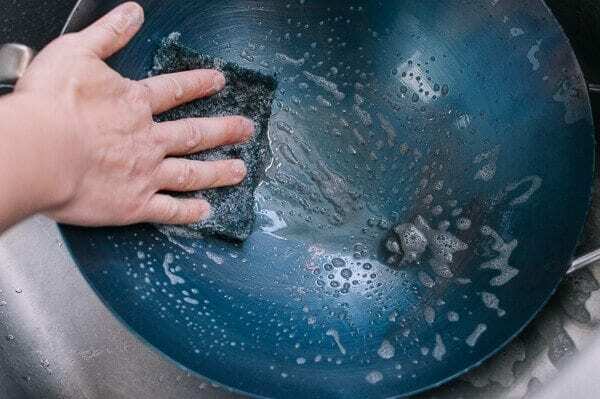 Scrub it thoroughly with a small amount of mild dish detergent using a pot scrubber and make sure to get the entire surface area as clean as possible. Hand dry and heat the wok over high heat (but not smoking), and let cool. Rinse and scrub the wok again lightly another time, and dry the wok over the stove. 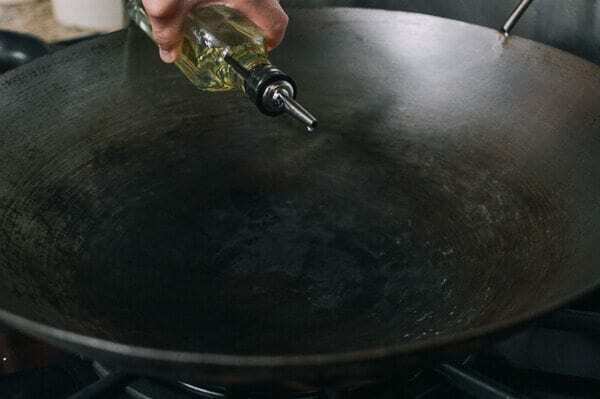 Heat the wok on low and pour in one tablespoon of oil, swirling the oil evenly. Remove from the heat. 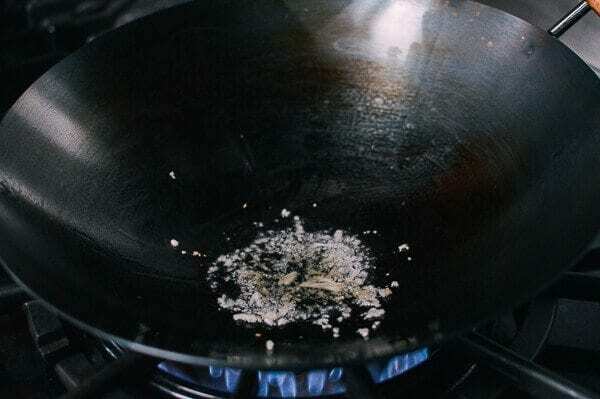 While the wok is still warm, use a paper towel to spread the oil on the entire inner surface of the wok. There should be no standing oil. Your wok is now again ready to use! 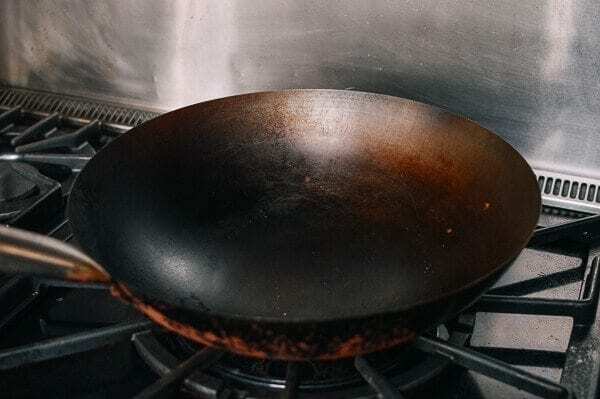 Sometimes a wok can rust on the bottom like this one pictured below. 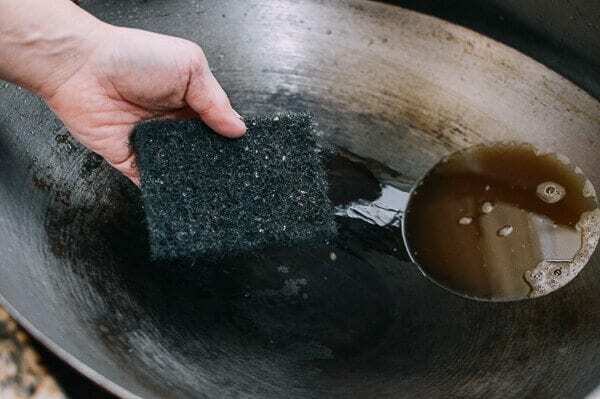 You can give the wok a good scrubbing to remove the surface rust and wipe it down with a few drops of oil on a paper towel. 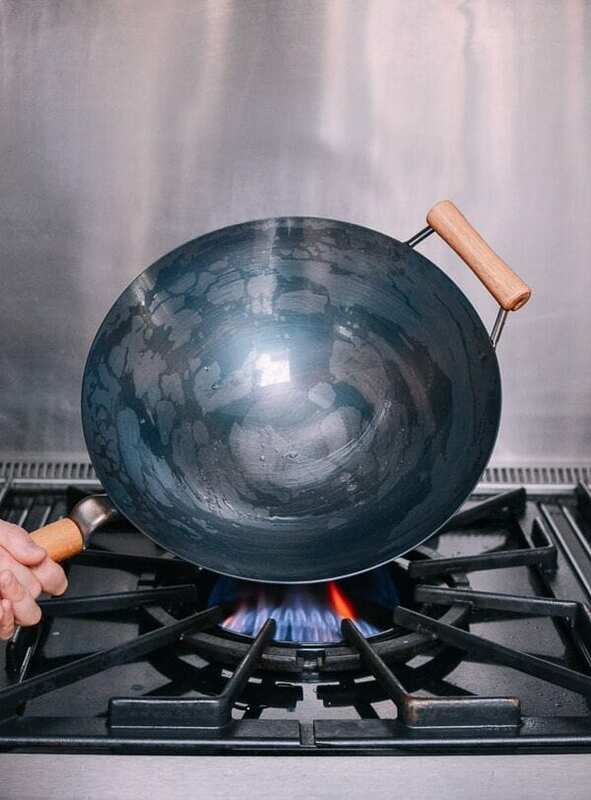 In general, regular use of the wok and heating it to a high temperature will prevent rusting on the outside, but be sure to heat the wok to dry the inside and outside after each use. After you’ve removed the food from the wok, wash the wok. 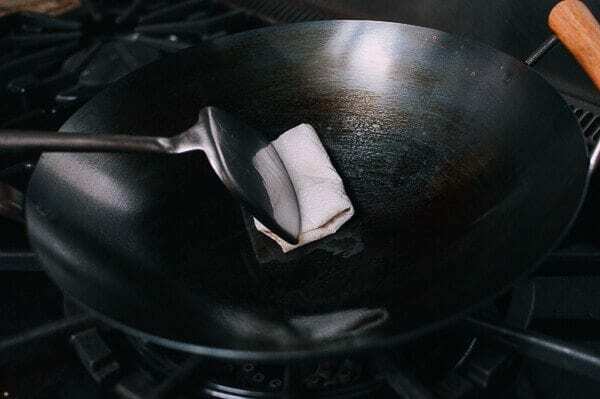 Some people think seasoning a wok means leaving the oil and film from your last meal, but that’s a common misconception. 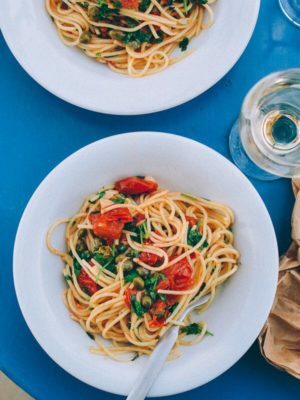 In general, just a light scrub with water is needed after light cooking. Use a circular scrubbing motion with a scouring pad. Clean it thoroughly! Don’t be afraid to use some dish soap to cut any heavy oil residue, but no need to scrub it to death either. You want to clean burnt and crusty pieces and any excess oil just like you do with any other pan. This is especially true after cooking dishes with heavy sauces or braising, when some of the sauce may be crusted on. If needed, scrub the exterior of the wok with the scouring pad. It’s fine if the outside of the wok is a little rough. Rinse the wok and dry thoroughly with a kitchen towel or paper towel. Place the wok back on the stove and heat until all the water has completely evaporated. Let the wok cool and wipe the inside of the wok down with a few drops of oil and a paper towel. 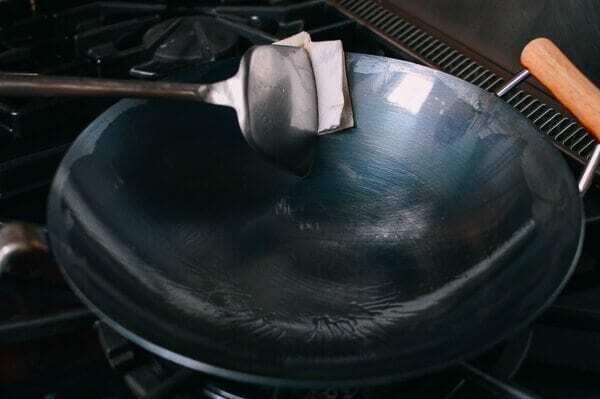 Wipe the oil all over the wok to give the surface a light coating. 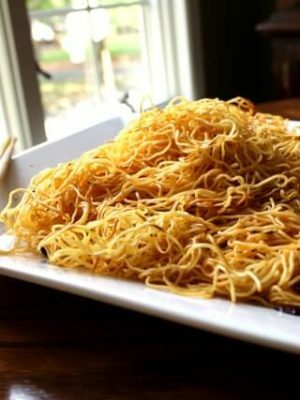 It’s perfectly normal to see some of the brown wok residue on the paper towel after a good wipe-down. 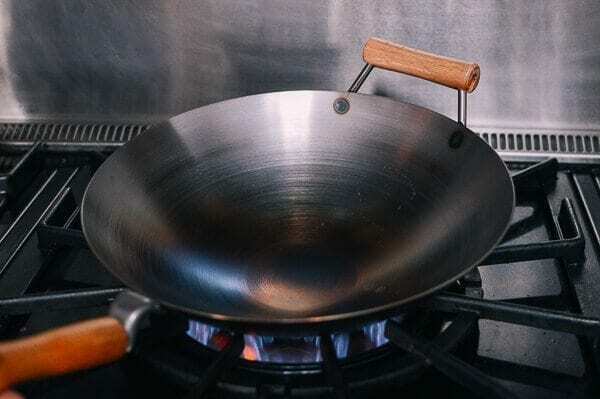 After any thorough washing (or if you don’t use your wok every day), it is best to add a bit of vegetable oil to your wok after it has dried out. If you do see some rust form the next time you use it, it is likely that it was not completely dried or you may not have used enough oil. This is our large 20 inch wok that we use on our range with the dedicated wok burner. We use this for steaming large dishes, cooking during the holidays and for parties, and when blogging, of course (lots of surface area for photographs)! You can see the beautiful shiny patina after using it almost every day for the past 12 years. 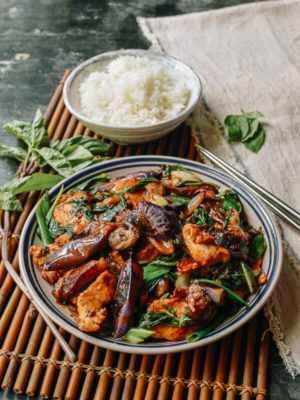 If you just cooked an especially strong food (e.g. 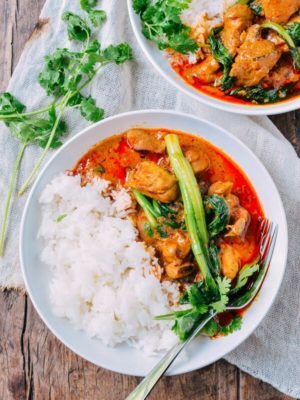 a fish or a curry dish), you may have to wash and heat the wok twice. 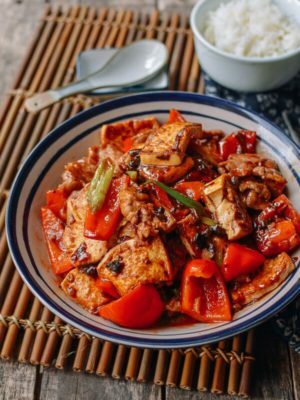 Heat helps rid the wok of the residual flavors. There’s nothing worse than cooking a lightly seasoned dish and tasting the fish you cooked last night. If you haven’t used the wok in a long time, you should wash the wok before using it. This is just common sense. 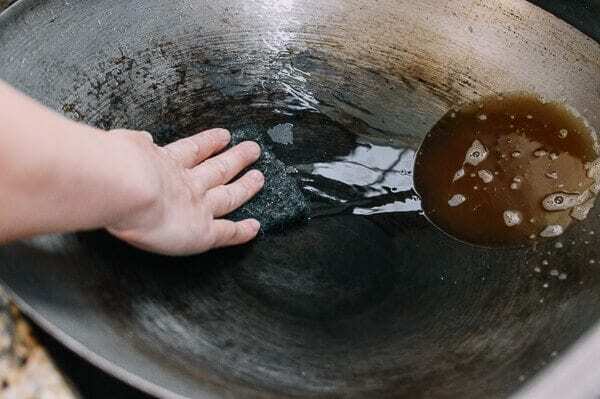 If you find the wok has a rusty spot, then you probably did not heat it long enough to get rid of all the moisture or did not use enough oil to wipe it down. Pay attention to these two important steps! Never put your wok in the dishwasher! 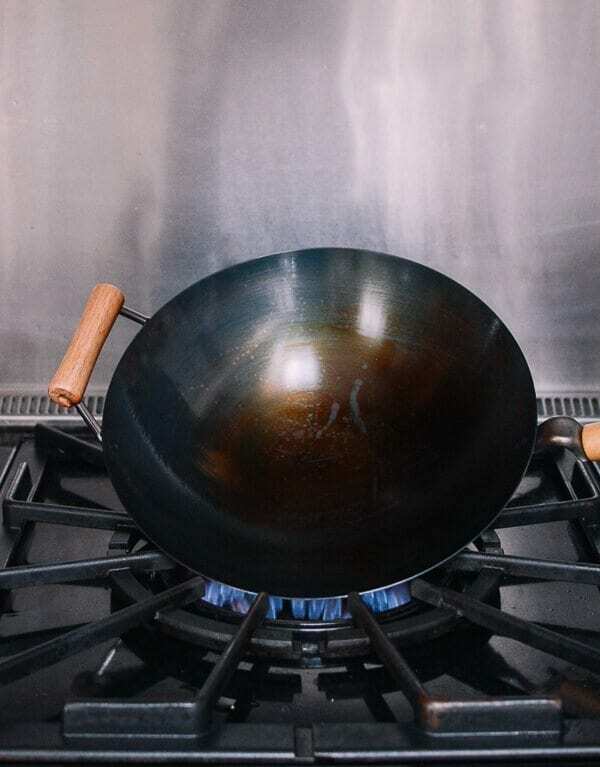 Always wash and dry your wok after cooking and wipe it down with vegetable oil, even after a simple steaming. 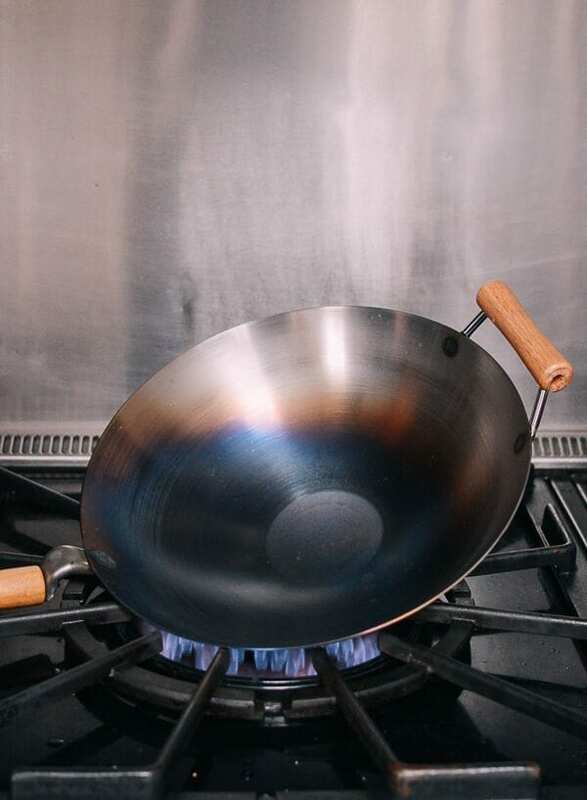 Wash your wok promptly after you cook with vinegar or any other acidic ingredient. 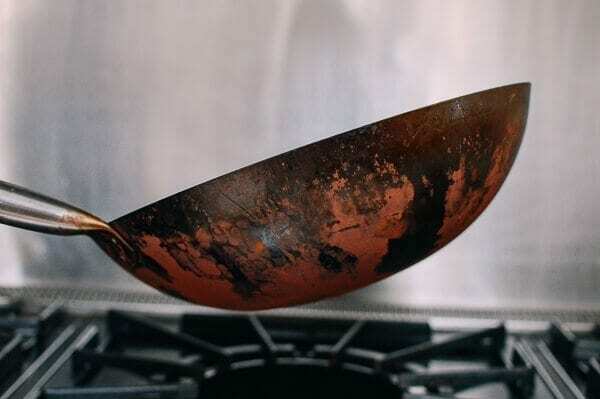 It will wear away the patina of the wok. 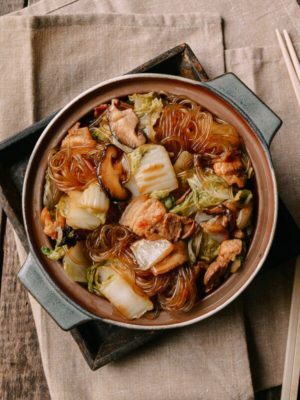 You can use a stainless steel wok or a pot to cook hot and sour soups or dishes like our sweet and pungent pork, Peking spare ribs, and sweet and sour fish. 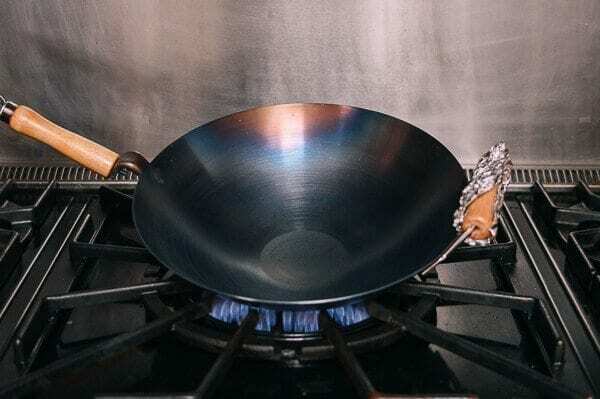 If you see buildup or if your wok is looking worse for wear, you can follow the steps for a new wok above to re-season it anytime. 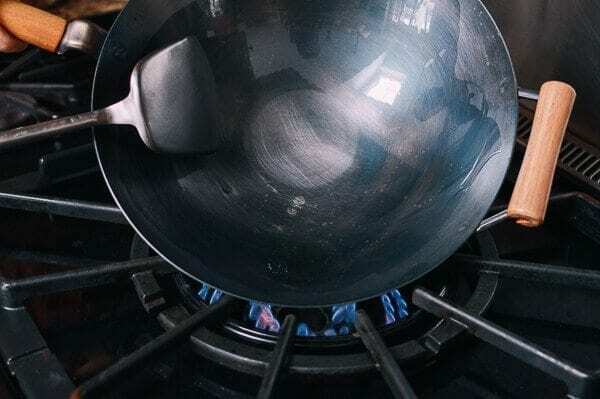 While we think carbon steel is the best overall material for a wok, carbon steel woks do require a seasoning process before first use and continued care and maintenance to build that desirable nonstick patina. 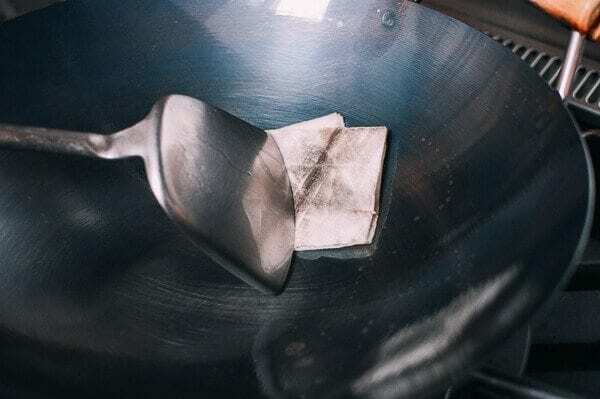 Here are instructions on how to season and care for your carbon steel wok. 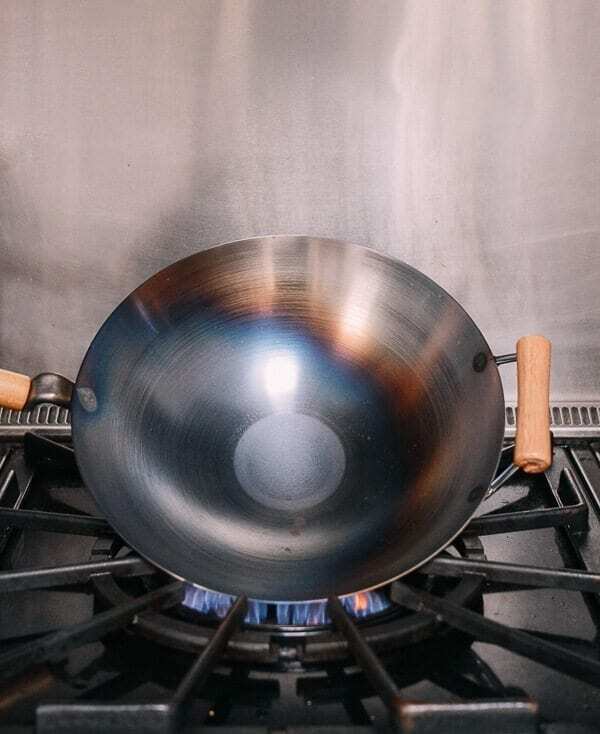 If your wok has wooden handles, wrap them in heavy duty aluminum foil to prevent them from burning. Set your wok on your stove set to the highest heat. Make sure you clear the stove area, because things will get quite hot. Keep a dry towel handy or better yet, a silicon or heatproof kitchen mitt in case the wok handles get too hot. Once the wok heats up, it will start to turn a dark brown color and will begin to smoke. This indicates that the residual oils from the wok are burning off. Next, the wok will begin superheating and the impurities from those industrial oils will burn off. Tilt the wok to superheat one area at a time and the wok will turn blue. Continue tilting the wok while you systematically burn off the impurities. The wok may not turn brown in all areas but you will see a degree of change in the carbon steel so make sure you heat all areas of the wok. This heating process will take some time depending on how hot your gas stove is. 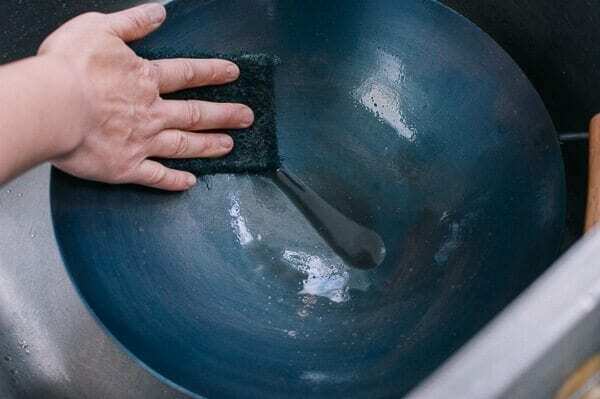 When your wok is completely cooled, move it to your sink and use some mild detergent and your scrubbing pad to give it a light scrubbing. Rinse your wok thoroughly with clean cool water. You may see some dark spots in the metal from impurities in the carbon steel but it is nothing to worry about. Wipe down the excess water with a paper towel and place the wok back on the burner to dry it with medium high heat. 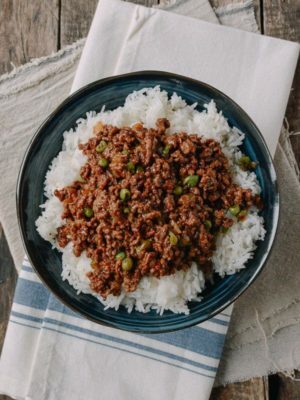 Turn off the heat and use a twice-folded paper towel to begin wiping down the wok. Use your wok spatula to start since the wok will be hot. I like to reheat the wok again before cooking on it until just smoking. Turn off the heat and repeat the washing again, giving your wok another light scrub with water only. Repeat this process one more time and your new carbon steel wok is ready for cooking your favorite dishes!